This treadmill comparison and rating guide is a great way to compare treadmills side-by-side in various price ranges. This way you get a thorough overview of all of the key features that are important in any treadmill you are looking at versus other treadmills in the same price range. Why Use Treadmill Comparison Charts? UPDATE: We've made it even easier for you to decide with our new Best Treadmills for 2017 section. Now you can see a complete list of the best machines by price or by type. But if you prefer to narrow it down yourself, continue reading below. Reviews will give you in-depth information about each individual model, but narrowing it down to several models that meet your needs should be your first step. In our treadmill comparison and rating charts we’ve included the categories that most buyers feel are important for every model we review. Just choose the price range you’re comfortable with, and then look for which models in that price range have the combination of features you feel are most important. Motor Horsepower – Important for determining how much power there is for the kind of workouts you do. Higher horsepower = better performance at high speeds and longer life. Some models may be manual, with no treadmill motor at all. Folding or Non-Folding – The best foldable treadmills are found in the $1000 - $2000 price range. Compare models with power-fold technology which let you fold the machine with the push of a button. Workout Programs – These are pre-programmed to give you workouts that variously target a specific heart rate, mimic sprints, runs, cross-training or even types of terrain. Running Surface – Compare the width and length of the actual treadmill running surface. LED/LCD Display – Is the display dot matrix, LED or LCD? Which is better for your lighting conditions and the kinds of read-out you need? Weight Capacity – How much body weight is the treadmill designed to hold and perform well with? Heart Rate Monitor/Control – How the pulse rate is measured, such as a wireless chest strap or a pulse grip read-out in the handlebars (read our article on how to work out in the “zone” with wrist model Polar heart rate monitors). Cushioning – A proper deck suspension system will be firm but have just enough give; the best cushioning systems absorb as much as 42% of your foot strike energy. Warranty – Which treadmill parts are covered and for how long. Does the warranty include labor and for how long? What makes a good treadmill warranty? Each of these details will give you a snapshot of what the individual treadmills have or don’t have. 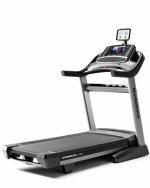 Once you’ve decide which features are “must have” and which aren’t, you can quickly see which brands and models listed in the treadmill comparison and rating guide may be right for you. Note: We only review motorized treadmills but we added a page on manual treadmills for those mulling the purchase of one. Looking for a commercial treadmill? Consult the commercial treadmill buyer's check list first!